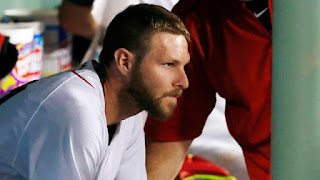 Up three in the American League East with five games left to the regular season, the Red Sox and Chris Sale found themselves on the wrong end of a 9-4 score against the Toronto Blue Jays Tuesday night at Fenway Park. Sale (pictured) was charged with five runs on eight hits including four home runs. Josh Donaldson took Sale deep twice, as the Red Sox ace saw his record drop to 17-8. J.A. Happ held Boston to just one run on four hits over seven innings. He struck out nine. The Yankees won, dropping the Red Sox lead to three games in the AL East.